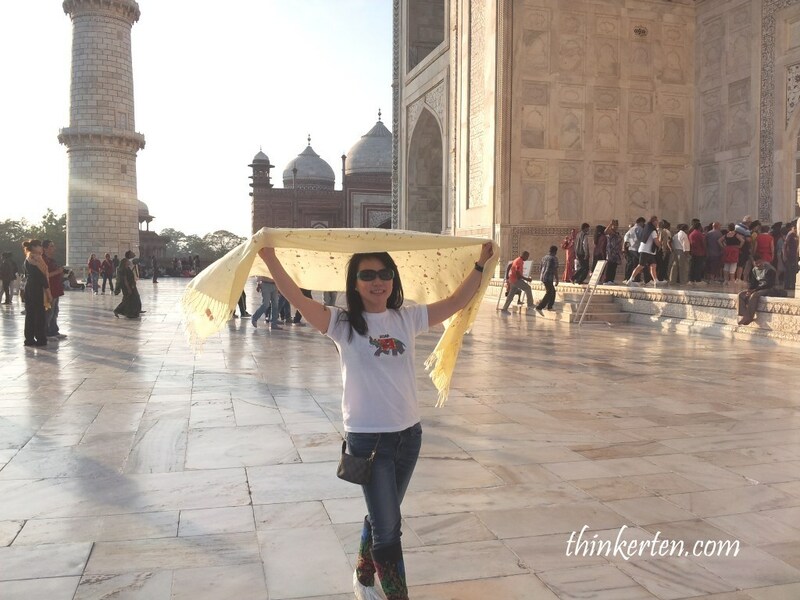 My second leg of the India Golden triangle is Agra. I have been waiting for this because Taj Mahal is in Agra. 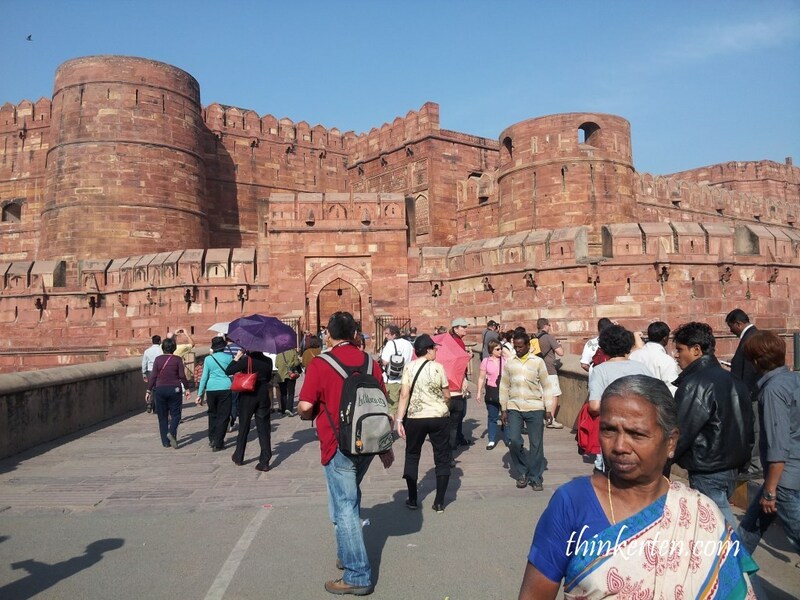 Beside Taj Mahal, Agra also has Agra Fort and Fatehphur Sikri, these three are Unesco World Heritage site. 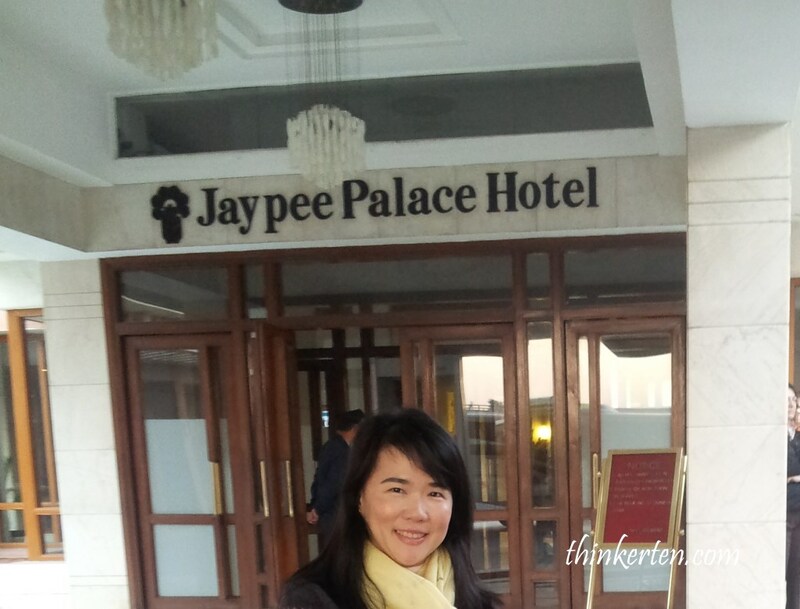 We stayed a night at the Japyee Palace Hotel and I strongly recommend this interesting hotel as some part of the building was in red, look like you are staying in a fort. The food in the restaurant was great with many variety to choose from. 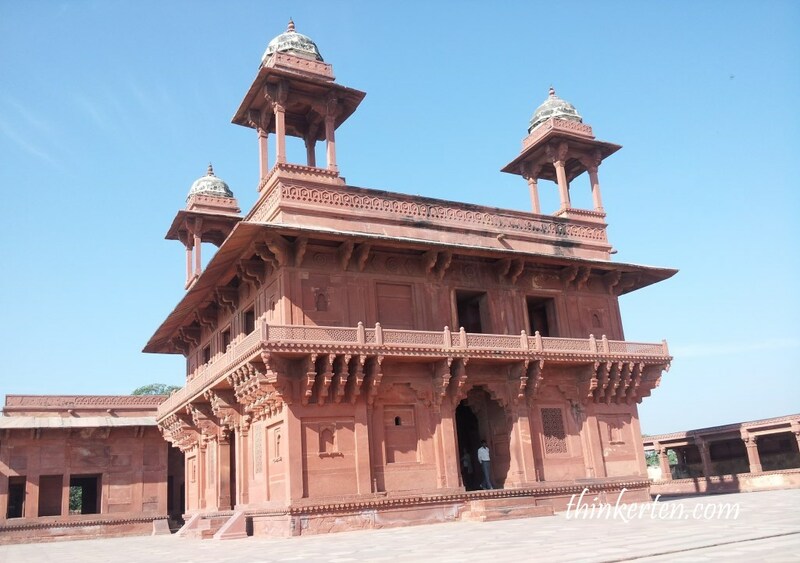 Fatehpur Sikri was founded by great Mughal Emperor Akbar and made as the capital. 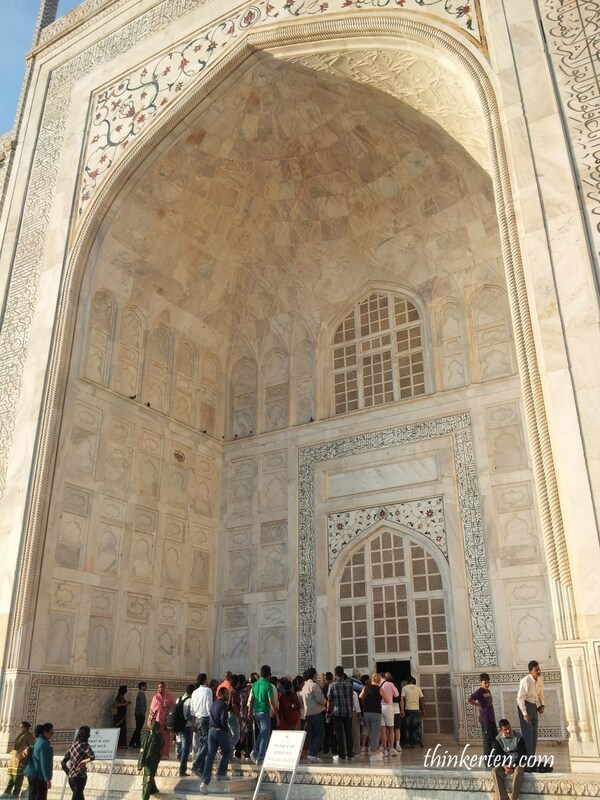 In here you can see the best preserved example of Mughal architecture in India. However it was later abandoned due to lack of water supply after Emperor Akbar’s death. One interesting fact is Emperor Akbar built these stunning palaces in Fatehpur Skiri for his three wives who were all from different religion, Hindu, Muslim and Christian, hence you can see the fusion of architecture here. 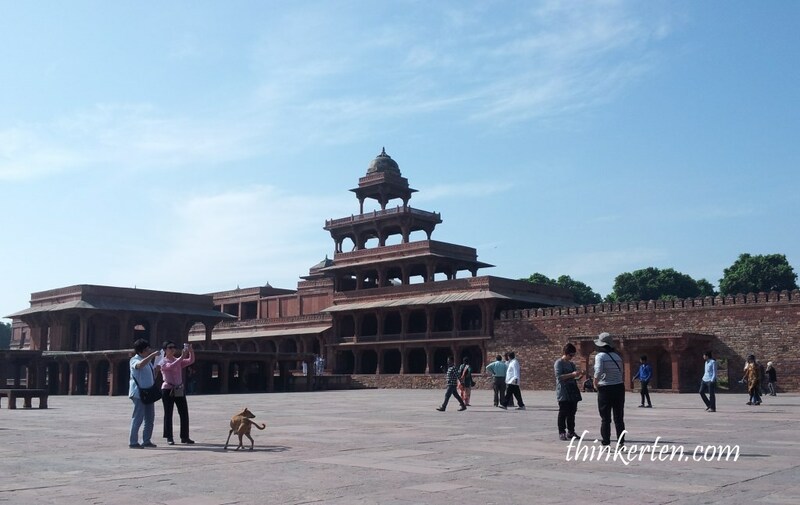 Again, this is the place for the Emperor to meet his officials and ministers.This is also the place that Emperor Akbar had representatives of different religion discuss their faith as Emperor Akbar embraced all religions. The remarkable lotus made by red sandstone can be found in the Hall of Private Audience. Try spot the biggest lotus which is located in the center of the hall. The big lotus in the central pillar represent unity and diversity. Why is red sandstone used? Red sandstone has the cooling effect in summer and it also keep you warm in the winter. I was hiding for some shade and when I touched these stones, it was very cooling. Guess how many pillars to built this pavilion? Total number of pillars to form this beautiful pavilion is 84 pieces. This is actually a wind catcher tower where the Queens and Princesses sit there to enjoy the breeze. It has some elements of a Buddhist temple, consisting four stories in total. This pavilion gives a majestic view of the fort if you climb to the top. 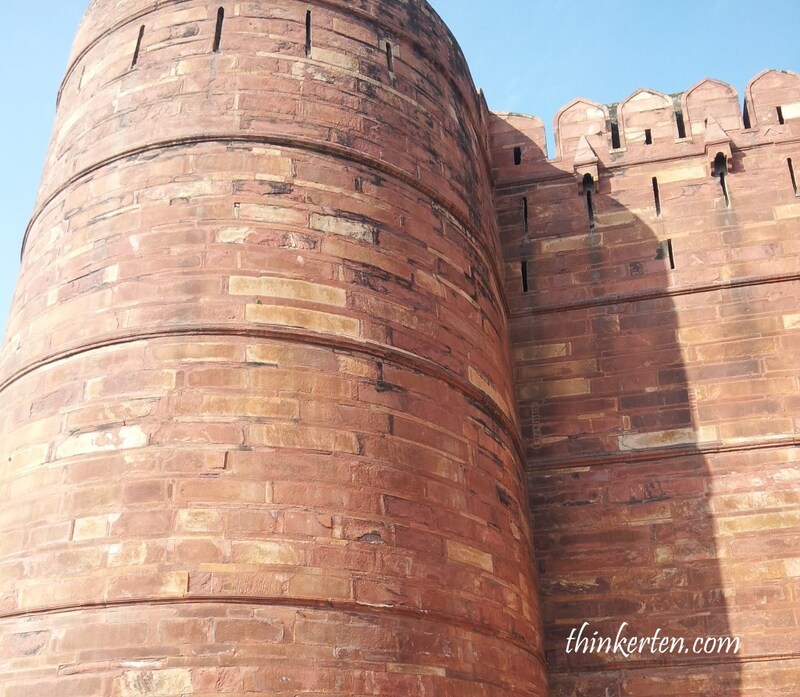 Our second Unesco Site in Agra is Agra Fort. 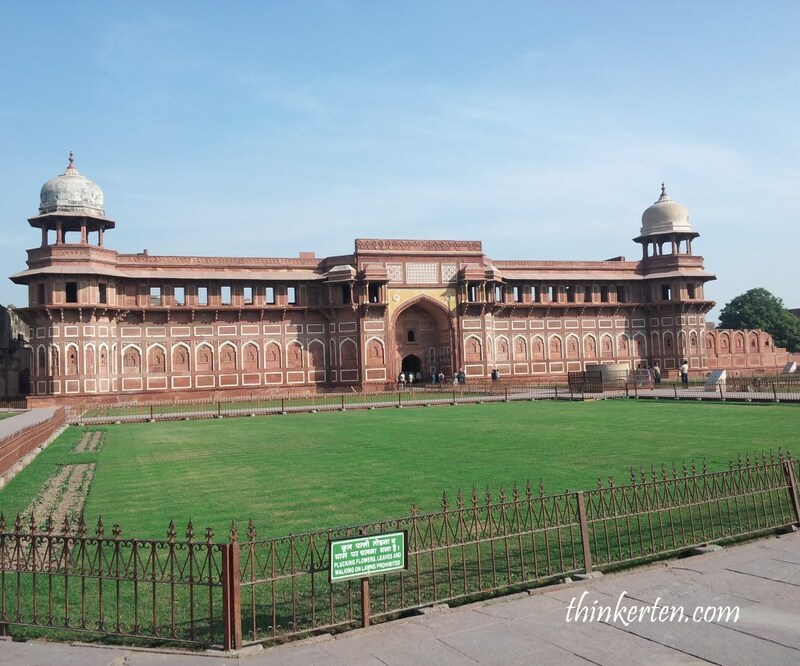 The Agra Fort was first built by Emperor Akbar in the 15 century but later his grandson Shah Jahan (the Emperor who built Taj Mahal) took over and added few extension with his favorite building material, the white marble. 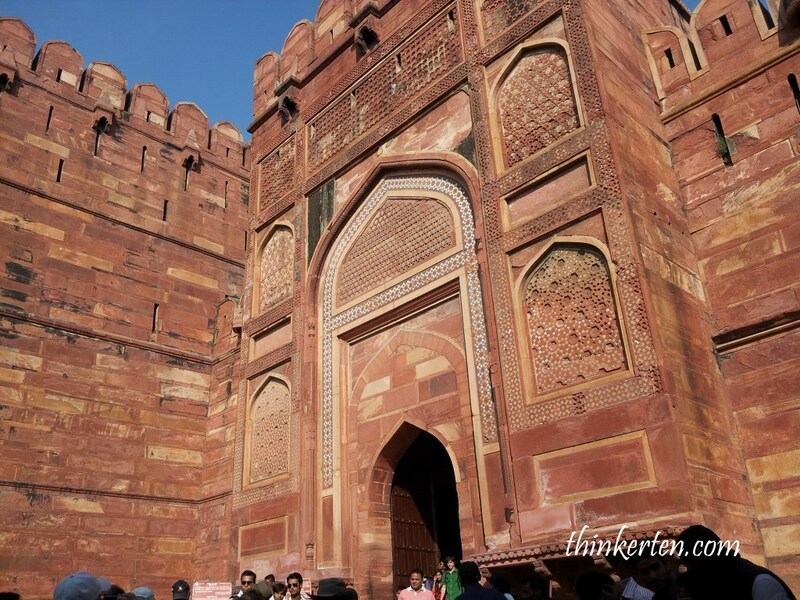 This is the entrance to the Agra Fort, you can see the fort is made by red sandstone hence Agra Fort also known as Red Fort. You need to walk pass this magnificent Gate before entering the real palaces. 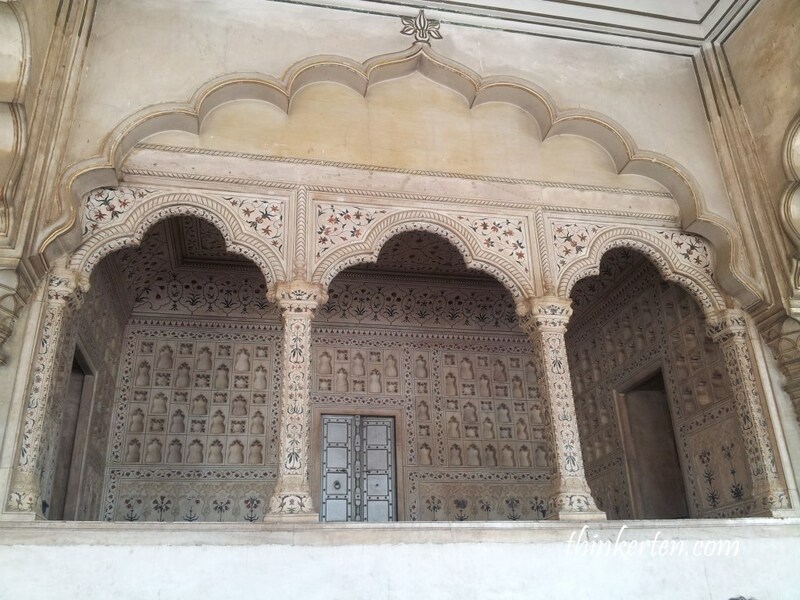 Akbar built it, later used for a separate quarter for the royal ladies for their praying. 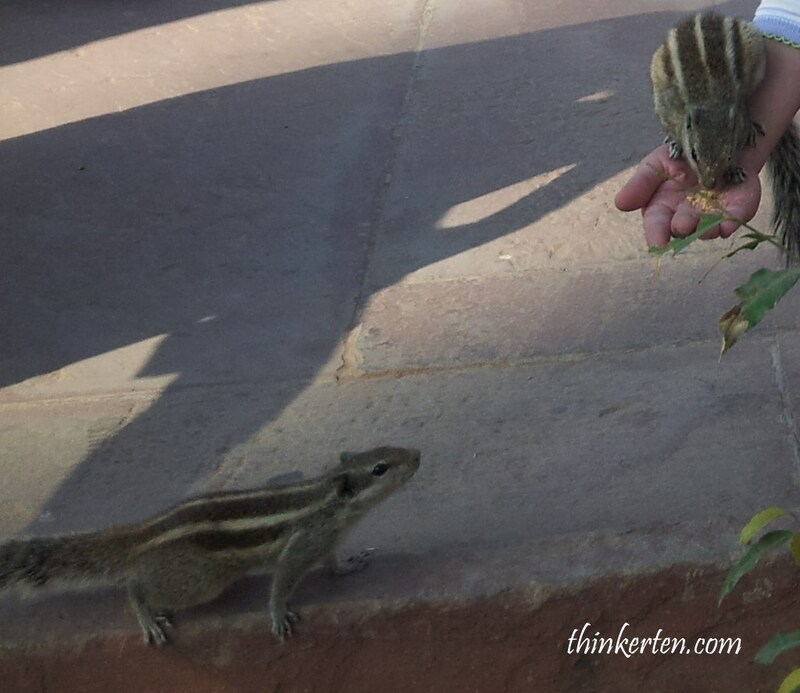 The best thing in Agra fort is to meet Alvin and his friends. An Indian man kindly handed us some food to feed the hungry Alvin, it was really fun to play with these little cute creatures. They nibble softly on your hand and are very friendly. Before we left, the Indian man asked us to pay for the food we just fed Alvin. Well, we paid a little money for him. It is reasonable to pay as we have so much fun! The word “Golden’ was used because of the gold color rooftop which also has element of the Bengali style as it’s characteristic. 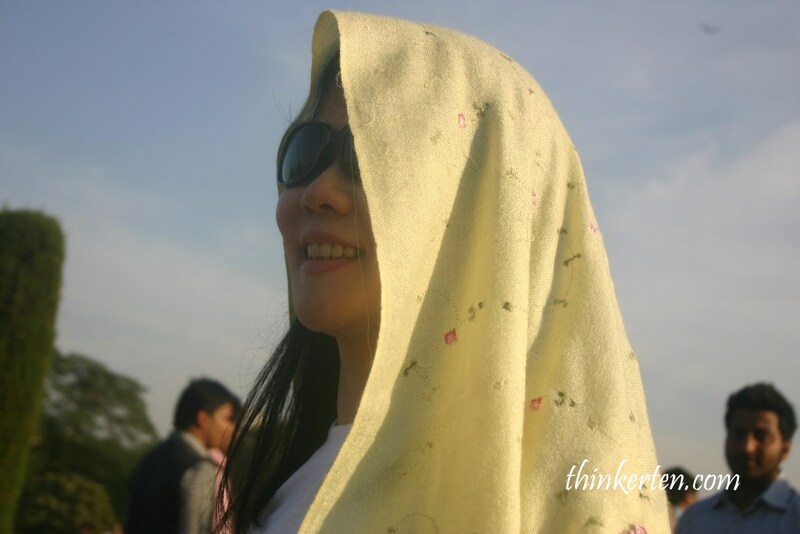 Standing at the Golden Pavilion you can see the Jumna River and enjoy some countryside view. 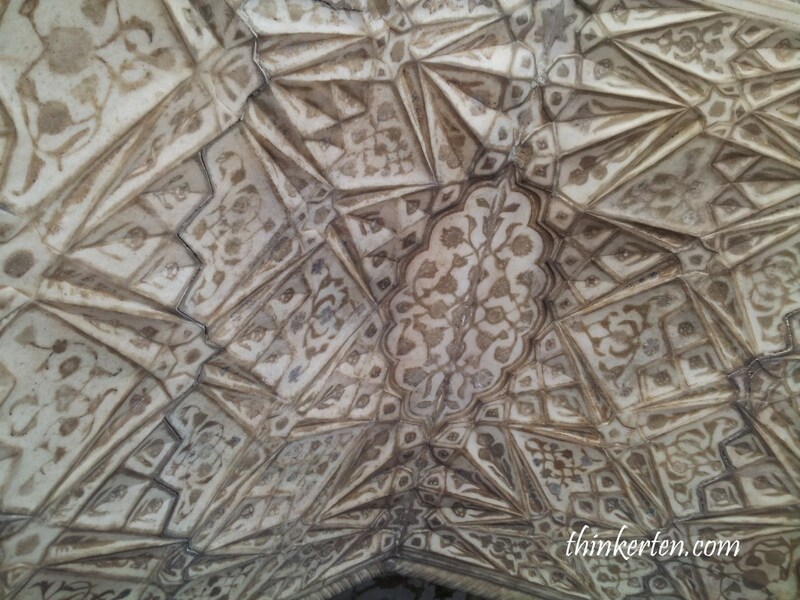 Decorations on the ceiling, built with white marble, I believe it was built by Shah Jahan as marble is his favorite building material. 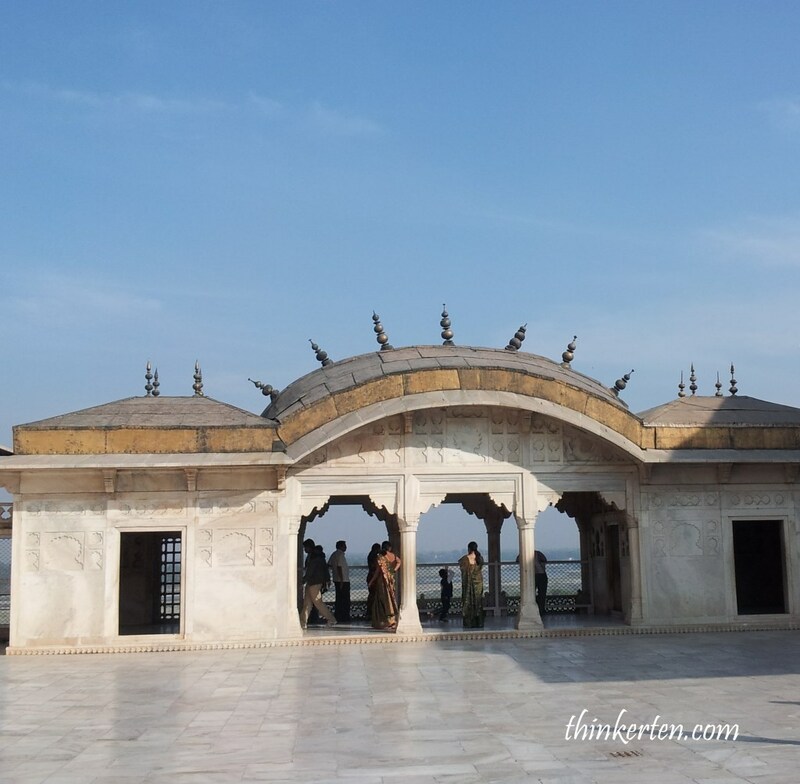 Shah Jahan was prison by his own son in this fort after his son seized power. Shah Jahan died in Muasamman Burj 8 years later, a tower with a marble balcony with a view of the Taj Mahal, the mausoleum Shah Jahan built for his beloved wife. 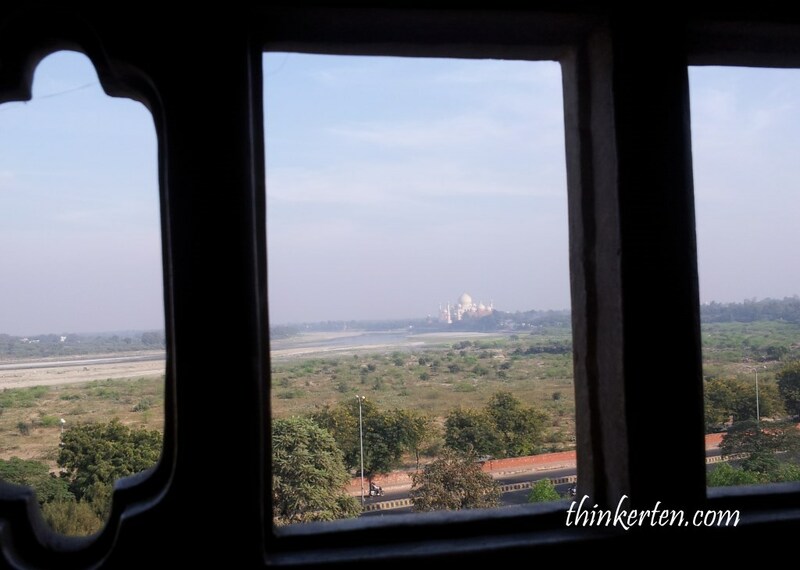 Shah Jahan’s son was still considered thoughtful to have kept his father here, a good view to admire Taj Mahal day and night. 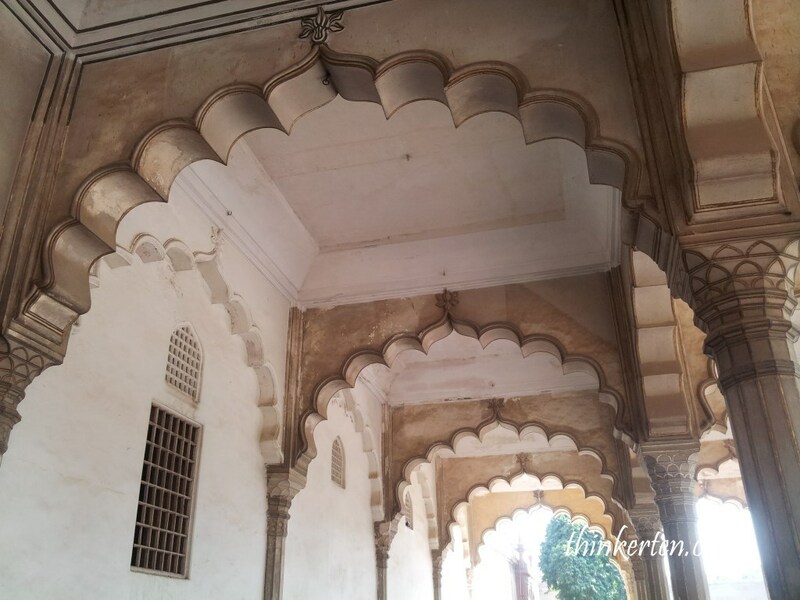 The final Unesco Site isTaj Mahal, there are a distance to walk in to Taj Mahal. 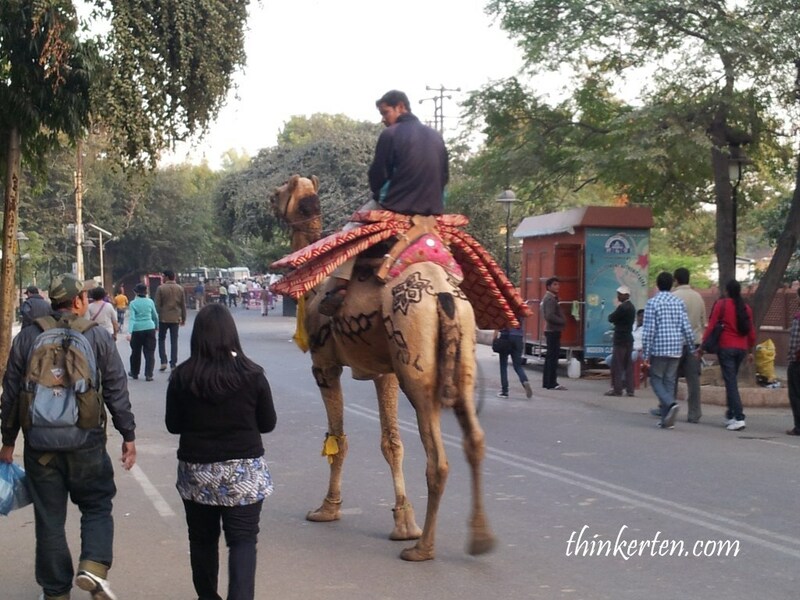 Saw a camel waiting to pick up tourists. 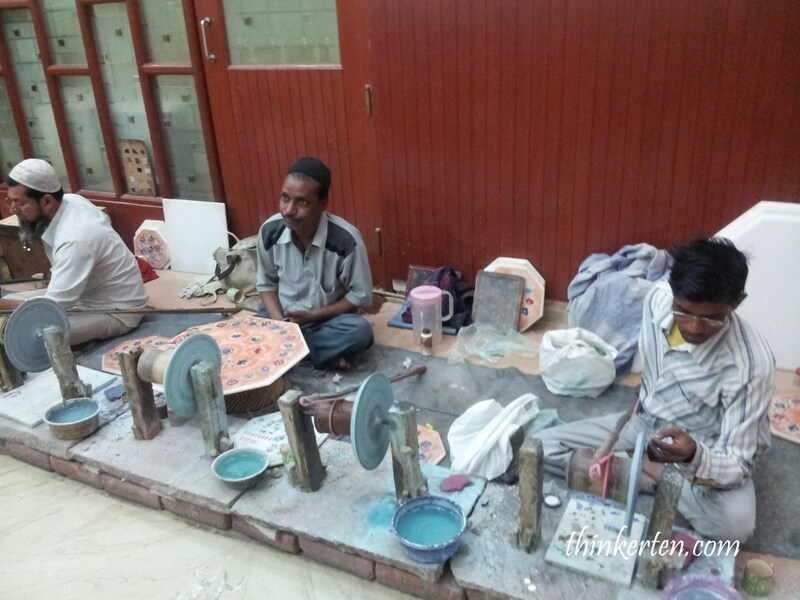 This place is very busy as there are more than 3 million tourists visit Taj Mahal yearly. 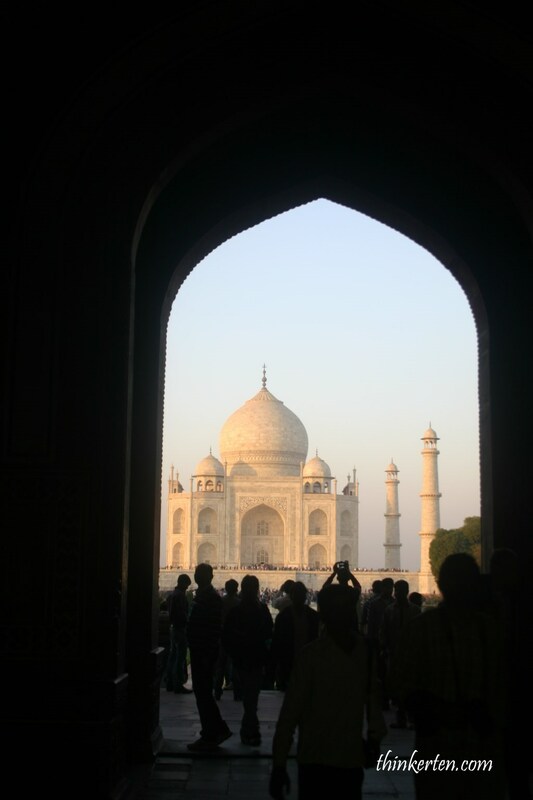 Taj Mahal symbolize love and romance. It is also one of the seven wonders of the world and also a symbol for the whole Indian nation. Shah Jahan built Taj Mahal for his favorite wife Mumtaz Mahal who died after giving birth to their 14 child. Mumtaz Mahal was Shah Jahan’s childhood love and considered as ‘the chosen one’ in the Palace. 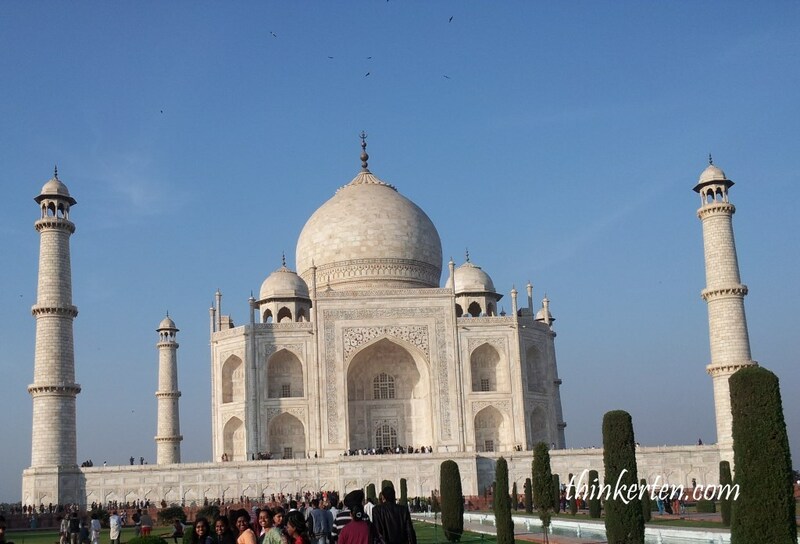 Taj Mahal was built with Shah Jahan favorite material, the white marble and house as a tomb for Mumtaz Mahal. Some people choose to come early to see the sunrise in Taj Mahal but I was here for the sunset. It is open as early as 6 am. People are queuing to pay respect to the tomb. Security is very tight. Observe every details here, it is breathtaking. It took almost 20 years to built the Taj Mahal and 20000 workers and 10000 elephants were involved in this huge project. 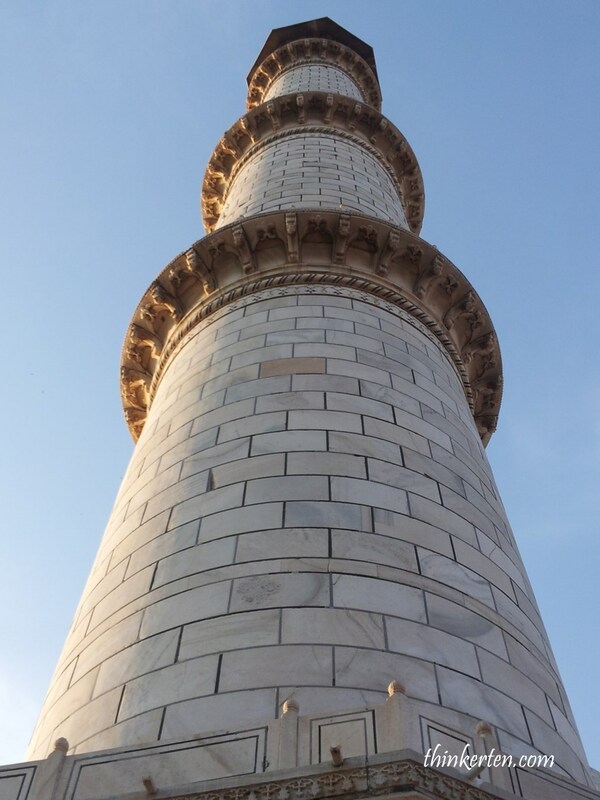 4 minarets, each about 40m high was built slightly slanting outward so when it collapse, it will not collapse at the Taj Mahal but collapse outward. 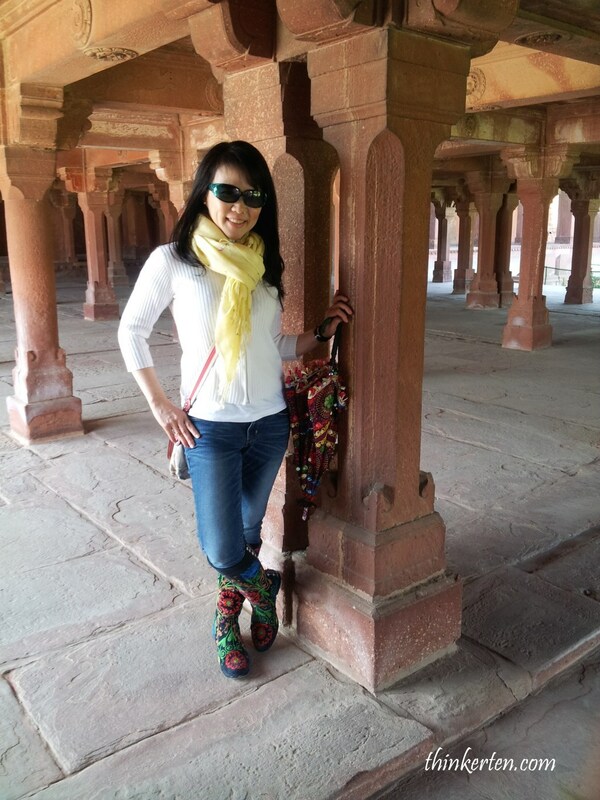 To protect the marble floor, I was given a plastic cover to put on top of my shoes when entering the marble tomb. The first view of the monument is framed by the main gate when you enter. (Refer to below picture). As you move closer, the Taj Mahal seems to get smaller. It seems to grow bigger as you walk away. 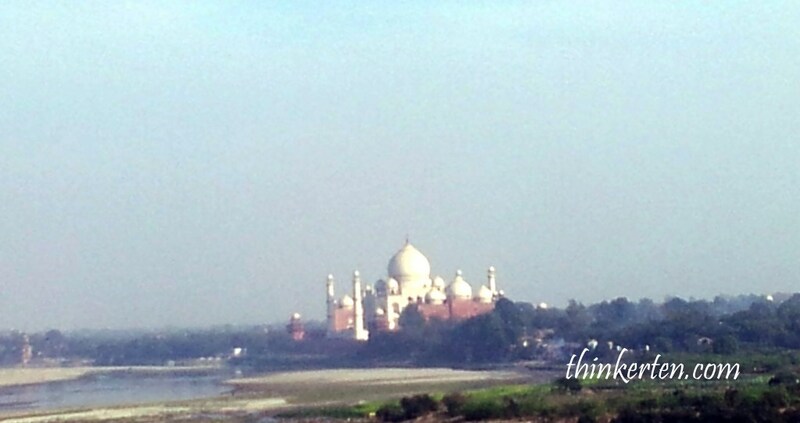 It is said when you leave you take the Taj with you in your heart. How romantic! Observe the color slightly changed in the evening. Our final stop at marble factory since this place is famous for it marble. 4 Minarets to support Taj MahalAgra FortAlvin and the Chipmunk friends in Agra FortAmar Singh Gate in Agra FortBest timing to visit Taj MahalCalligraphy on the wall before entering the tomb in Taj MahalDiwan I Am (Hall of Public Audience) in Agra FortDiwan-I-Khas - Hall of Private Audience in Fatehpur SikriFatehpur Sikri - City of VictoryGolden Pavilion in Agra FortJahangir Palace in Agra FortJaypee Palace HotelLotus pillar at Fatephur SikriMarble factory in AgraPanch Mahal at Fatehpur SikriPrison for Shah Jahan in Agra FortTaj Mahal - Jewel of the PalaceTaj Mahal Optical trick - experiment it yourselfTaj Mahal Romantic StoryWhy is red sandstone used?